GSM Time Hierarchy is also known as GSM Frame Hierarchy. In GSM, frequency band of 25 MHz is divided into 200 KHz of smaller bands. Each carry one RF carrier, this gives 125 carriers. As one carrier is used as guard channel between GSM and other frequency bands 124 carriers are useful RF channels. This division of frequency pool is called FDMA. Now each RF carrier will have 8 time slots. This division time wise is called TDMA. Here each RF carrier frequency is shared between 8 users. Hence in GSM system, the basic radio resource is a time slot with duration of about 577 µs. This time slot carries 156.25 bits which leads to bit rate of 270.833 kbps. This is explained below in TDMA GSM frame structure. The GSM frame structure is designated as hyperframe, superframe, multiframe and frame. One GSM hyperframe composed of 2048 superframes. Each GSM superframe composed of multiframes (either 26 or 51 as described below in Figure 2.1). 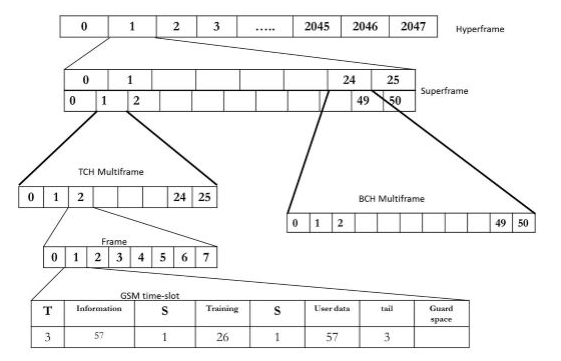 Each GSM multiframe composed of frames (either 51 or 26 based on multiframe type). Each frame composed of 8 time slots. Hence there will be total of 2715648 TDMA frames available in GSM and the same cycle continues. As shown in the Figure 2.1 below, there are two variants to multiframe structure.  It is called as Traffic Multiframe.  It composed of 26 bursts in a duration of 120ms, out of these 24 are used for traffic, one for SACCH and one is not used.  It is called as Control Multiframe.  It composed of 51 bursts in a duration of 235.4 ms.
 This type of multiframe is divided into logical channels. These logical channels are time scheduled by BTS.